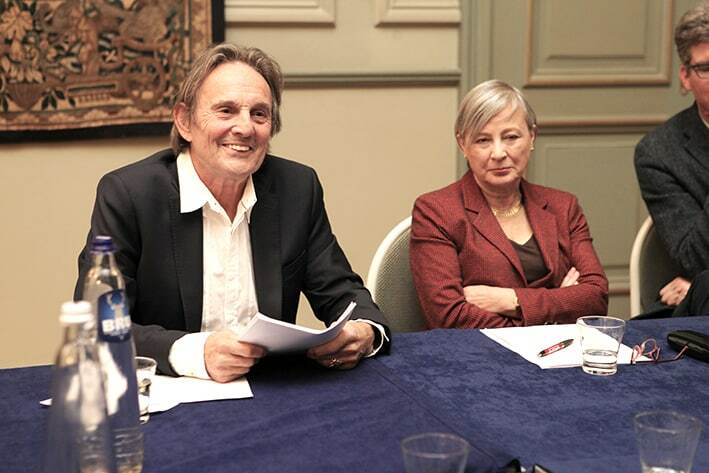 With the European Parliament soon to express itself on the review of EU Copyright Directive, British artist Murray Head and Member of the European Parliament Mary Honeyball (S&D, UK) came together today in Brussels in support of the FAIR INTERNET coalition. This European wide campaign is calling for the fair treatment of performers in the digital world. Consumers in Europe predominantly access creative content such as music and movies today via on-demand services like Spotify, Netflix and iTunes. Almost all performers, both in the audio and audiovisual sector, are, however, not fairly remunerated for these forms of exploitation of their performances. British singer and actor Murray Head, most recognised for his international hit songs such as “One Night in Bangkok” and “Say it Ain’t So”, stated: “I am here to lend my support to all European performers. The time has come to pay them properly when their performances are used online”. Nacho Garcia Vega, President of the International Artists Organisation (IAO), emphasised that “the derisory remuneration that most artists receive from the flourishing streaming business is not only an unfair reality but also the anchor that could slow down the great DSM project”. Mary Honeyball, a British Member of the European Parliament representing London, and who has been working on the review of Copyright Directive in the European Parliament, added her support to the campaign by stressing: “As politicians it is time to turn our sympathy for Europe’s performers into concrete actions. The upcoming vote on the review of the EU Copyright Directive will hopefully support giving a brighter future to hundreds of thousands of performers”. Dominick Luquer, General Secretary of the International Federation of Actors (FIA) added “By and large, the sharing of revenues from online use invariably shores up in the pockets of producers. The value gap provision in the Directive is not going to change this but this much needed measure undoubtedly will”. Xavier Blanc, Secretary General of the AEPO-ARTIS, representing over 36 European performers’ collective management organisations, one of the 4 organisations behind the campaign, pointed out: “From a legislative point of view, the upcoming vote is a pivotal moment for culture, and the performers that help define it. 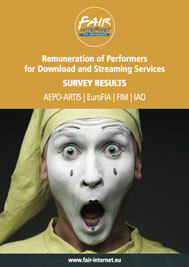 A positive outcome will transform the livelihood of the vast majority of performers in Europe by giving them a fair return for the exploitation of their performances online”. “The Fair Internet proposal is a simple and modern solution to a shockingly imbalanced situation. It will allow all European performers to be fairly rewarded for the online use of their creative contribution“, concluded Benoit Machuel, Secretary General of the International Federation of Musicians (FIM). The FAIR INTERNET coalition, which represent over 500,000 musicians, singers, actors and dancers across Europe, calls for the introduction of an unwaivable right to equitable remuneration for on demand use, paid by on-demand platforms (iTunes, Netflix, Spotify…) and subject to mandatory collective management by a performers’ collective management organisation in the draft EU Copyright Directive, published by the European Commission in September 2016. The provisions in the Commission proposal (articles 14-16) seeking to increase transparency, enable contract adjustments and facilitate conflict resolution, are currently too weak and fail to address the fundamental needs of most performers in the online environment. With only a few exceptions, the suggested provisions will not generate additional revenue for them. The much debated article 13 on the “value gap”, as it stands today, would only benefit few performers unless it is combined with an unwaivable right to remuneration. Two committees of the European Parliament have already adopted their opinions supporting this unwaivable right. It is a simple but effective mechanism to improve the livelihood of all performers in a meaningful way. The leading Legal Affairs Committee will vote on this before the end of the year. In parallel, the Council is discussing the draft Directive in its working groups. So far, the Fair Internet partners are disappointed and concerned to see that the precarious situation of Europe’s performers is not addressed at all by recent compromise proposals. The Fair Internet coalition calls upon Member State governments and the European Parliament to support a right to remuneration for all performers, in order to effectively rebalance copyright and ensure that Europe’s performers are at last fairly rewarded for the on demand use of their performances.